Michael “Mike” Ray Sevy was an individual who will be remembered for his qualities, such as his integrity, his high energy level, his determination, his stellar customer service, and his Christian faith. People in the coal industry will remember Mike for his enthusiastic dedication to helping their industry succeed, and the thoroughness with which he investigated the various wear problems they experienced. 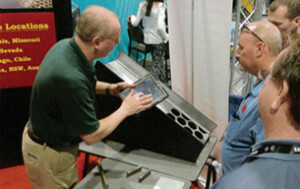 It was amazing to watch as people would approach the trade show booth. Mike addressed them all by name from afar. He appeared to know everyone–prep plant operators, maintenance people, purchasing agents, managers, and even their family members. The respect people had for Mike was evidenced in how they were willing to share the details of their lives with him. Mike lost his battle with cancer this past November, but his legacy lives on. 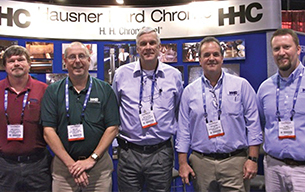 The 26(+) year veteran of Hausner Hard Chrome, Inc. was a distinct and unique man. He will be missed by all who were fortunate enough to have met him. Mike Sevy began his career at HHC working in the Quality Assurance department. 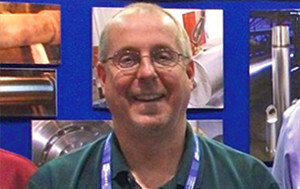 Mike was a tool and die maker by trade, and that background helped to accelerate him from a technician to the position of HHC, Inc. QA Manager in just a few short years. Fifteen years later Mike was asked to transition into his gifting: Application Specialist. He was asked to focus his attention on the coal industry. Mike optimistically accepted the challenge without much previous sales or coal mining experience but, like all things, Mike tackled it with a high level of tenacity, and his light began to shine brighter and brighter the more involved he became. His zeal and determination, combined with his technical knowledge, allowed Mike to perform very well at all aspects within the coal preparation and mining community. Mike’s passion for taking care of customers exceeded all expectations and, quite frankly, amazed many HHC customers who were not accustomed to such efficiency. In the days and weeks after Mike’s passing, dozens of e-mails, cards, letters, and phone calls came pouring in from people who knew Mike or had met him during his travels with HHC, Inc. A large majority of the folks were expressing sorrow, while also alluding to the zeal and determination Mike carried with him everywhere he went. The old saying “he never met a stranger” applied to Mike because he would talk to just about everyone. Mike was a man of outstanding character! If he said he was going to do something for you, he did it. Mike was an active member of the CPSA and attended Coal Prep meetings in Evansville. On many occasions Mike would remember something an attendee had asked him from a month earlier, and he would work to gather things up and prepare properly so he could present the items back to that person. One of the older HHC men once asked Mike about his memory skills. His response, “My memory is as hard as chrome.” When Mike traveled out to coal prep plants and mines, he always went prepared to meet someone new and to take care of those he knew. Most everywhere he traveled Mike had attained an open door policy. 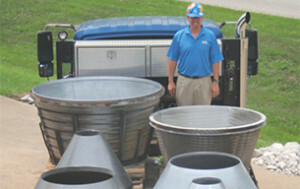 Mike’s customers trusted him to be on site, and to be as safe as any employee there. That meant a lot to the plants, and it meant a lot to Mike that he had earned that trust. Those who allowed him access knew he was there to take care of them. It was no secret that Mike’s love for taking care of others burned better than the best Met Coal produced. So often in our lives we take others for granted, and it is only when we lose someone that we realize how remarkable they really were and how many lives they have touched. It was my privilege to be Mike’s co-worker, but it was my honor to call him my friend. Whether co-worker, customer, or friend we all share commonality in our descriptions of Mike: honest, a man of integrity, respectful, passionate, and knowledgeable. It’s been said, “Mike didn’t have customers or co-workers; Mike had friends that he worked with.” Mike left behind more than his many friends. He left his lovely wife, two lovely daughters, one brother, and his parents. Mike’s family was his heart and soul. Mike’s love for his family was never overshadowed by anyone or anything; he made certain of that and he would encourage us all that family comes first. Mike told of a time he was checking into a hotel that he often stayed at when traveling. His wife was with him, and before he could introduce her, the receptionist said, “You must be Mike’s wife! Mike talks about you and the girls every time he stays with us.” Even as bright as Mike’s passion and zeal for his work was, it paled in comparison to the passion and zeal he had for his family and his Christian faith. Mike asked that a final message concerning the importance of his Christian faith be shared with all. The response to Mike’s farewell message was astonishing. One would think a dignitary or statesmen had passed away by the overwhelming show of love and respect that was shown to him and his family. But in all reality, one did. He left us way too young at only 56 years old, but we are comforted that his life was well lived. His employer and the industries he served, especially coal, are different because of Mike and they will never be the same again. Thank you Mike! 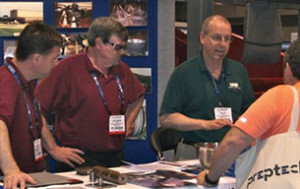 Left to right: Joe Hagan, Larry Covington, and Mike Sevy. Left to right: Larry Covington, Mike Sevy, Bob Hallstrom, Dave Hausner, and Joe Smith.